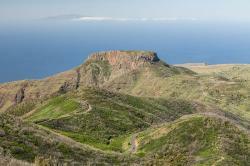 Explore the Chipude Fortress in Vallehermoso, La Gomera. Chipude Fortress is located in the municipality of Vallehermoso in the central region of La Gomera, in the Canary Islands. The Chipude Fortress was produced from the accumulation of lava around the emission duct. As main characteristic you might identify a plateau configuration profile with steep walls and large cracks produced by its quick cooling. If you take a close look at the sides you’ll see that they’re practically vertical serving as a habitat to many native flowers for example the siempreviva and the knapweed. This place has a practically circular shape and if you want to reach the top you ought to know that there’s only one narrow way between the rocks which goes up till the 1240 meters high. This is the perfect natural refuge. According to local legends the summit was used a refuge for locals, to shepherds, as a fortress and as a holy territory.